Paul Raimonda (1922-1988), an outspoken community leader in Long Island City, Queens, was born in New York on July 5, 1922. Raimonda lived his entire life in Long Island City. He attended P.S. 126 and Bryant High School, and served for four years in the Army Air Corps during World War II. Both during his youth, when he was an active member in the Long Island Seneca Club, and in his later years, Raimonda was committed to his community. One of Raimonda’s notable contributions to his community was the formation and launching of the Astoria Heights Homeowners and Tenants Association in 1971. With the aid of several other members of the community, Raimonda, through the Tenants Association, sought to give a unified voice to the interests of residents. He was instrumental in leading a successful campaign to block a state takeover and expansion of Rikers Island in 1980. His cry of “community unity” was often used during the campaign to spark the fight and draw the support of major civic and political organizations. Raimonda was a member of Community Planning Board 1 and of the Liberty Regular Democratic Club. In April 1987, the Italian-American Regular Democratic Association of Queens named him Man of the Year, and he received the good wishes of Governor Mario Cuomo. Peter Vallone, Speaker of the City Council, said of Raimonda’s commitment to community: “He was willing to get involved in any community issue no matter where it was. He participated in every community battle in greater Astoria and Long Island City.” After a two-year fight with cancer, Paul Raimonda died in December 1988. 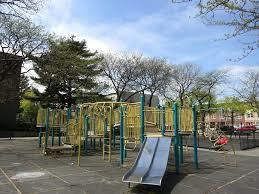 Raimonda Playground, bounded by 20th Avenue and 47th and 48th Streets, was formerly known as Steinway Community Playground after the northwestern Queens neighborhood in which it resides. The area is named for Steinway and Sons, the firm of piano manufacturers formed in New York in 1853 by Henry Steinweg. Between 1870 and 1873, Steinway and Sons bought 400 acres of land along the northwestern shore of Queens and located the company’s plant there. During the following decade, Steinway and Sons built a spacious factory and a town with a church, library, kindergarten school, and public trolley line. Unlike other factories, Steinway was not exclusively for workers since the firm treated the property as a real-estate investment, selling land and houses. Eventually, employees only constituted one third of the land’s inhabitants. The City of New York acquired the land for this park in three parts in 1940 and 1941, when three executors of the Estate of Samuel Untermeyer deeded the land to the city for “park purposes.” On February 21, 1941, Parks officially gained jurisdiction over the property and drew up plans to construct a playground there. Soon thereafter the playground opened, equipped with handball and shuffleboard courts, a basketball court, a rollerskating area, wading pool, swings, see-saws, a comfort station, lights, and appropriate safety surfacing. On January 27, 1948, a local law named the park after the neighborhood and its namesake. 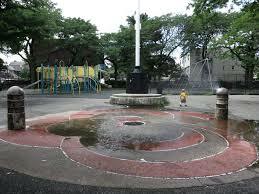 In 1995, Councilman Peter F. Vallone sponsored a $527,000 reconstruction of the play equipment and surfacing at the playground. In addition to the facilities built during the initial construction of the park, Raimonda Playground now contains several sitting areas with benches and game tables, a large sandpit, two jungle gyms, a flagpole and yardarm displaying the United States, City of New York and Parks flags, a water fountain, and a sprinkler system.